We awoke on Day 7 a bit stiff and sore but excited to see the sun. Our journey today would take us through some of the largest trees in the world - the coastal redwoods. The river was still flowing very fast and was in a semi-flooded state. We enjoyed the current pushing us down river. 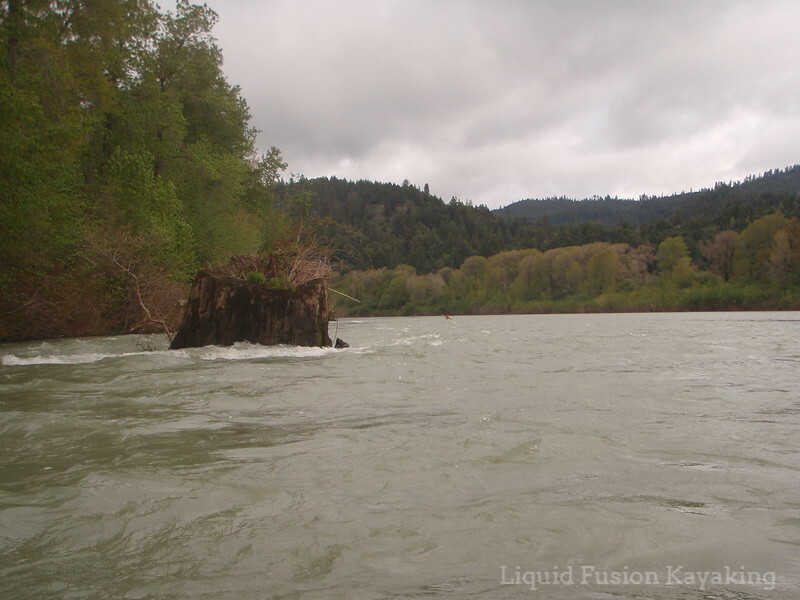 Giant redwood stump in the flooded Eel River . We pulled over to take a hike in one of the groves of Avenue of the Giants. For our hike, we took off most of our paddling gear but kept our drysuits on. Hiking up a creek to get into the Avenue of the Giants. 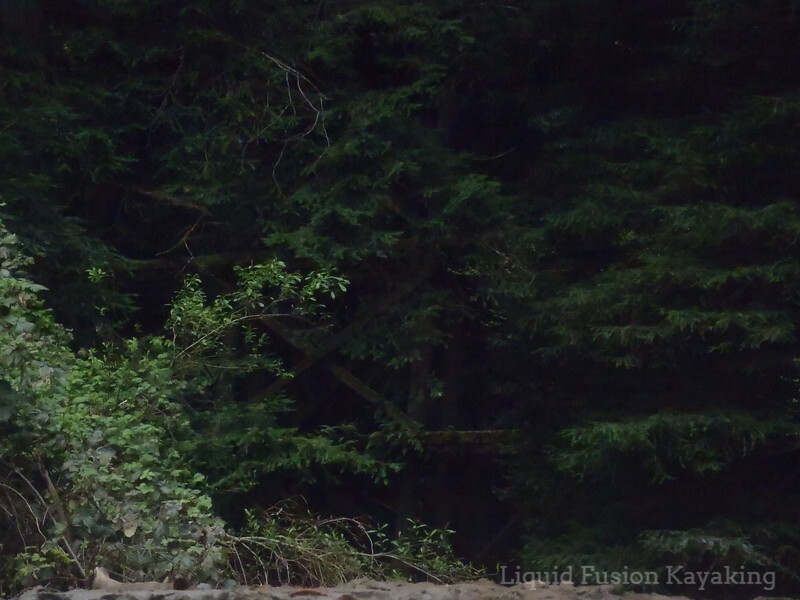 We came upon a local photographer that was hiking in the forest. He looked at us like we were aliens - guess we looked a bit odd in our drysuits. We said hi and continued on. He doubled back and asked us why we were dressed in yellow suits. 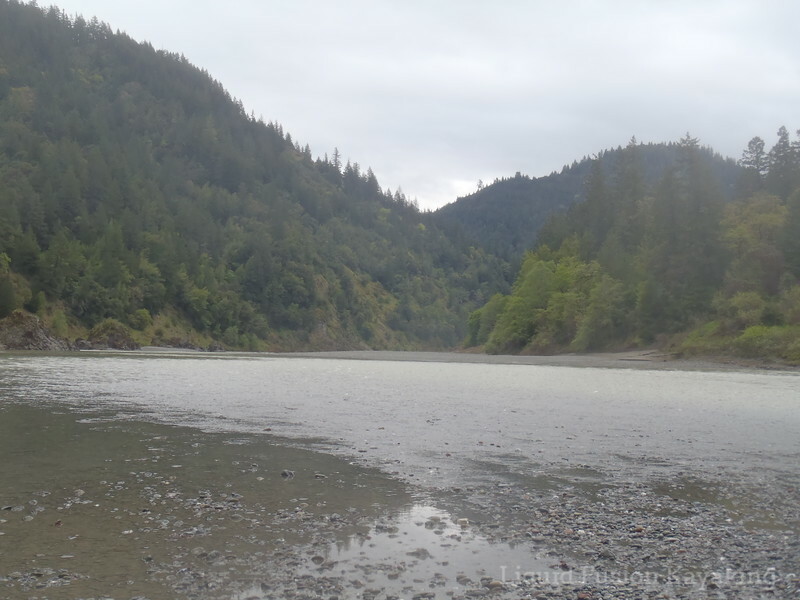 We explained that we were on our seventh day of kayaking the Eel River from the mountains to the sea, and we just pulled over for a hike in the redwoods before continuing with our journey. Hiking among the giant redwood trees of Avenue of the Giants. He was very interested in our trip and shared that he likes to do multi-day cross country motorcycle camping trips. We inquired about his photography and found out that he is an amateur photographer that works full time in the lumber mill in Scotia. After an interesting chat, he wished us well and we continued on our hike. 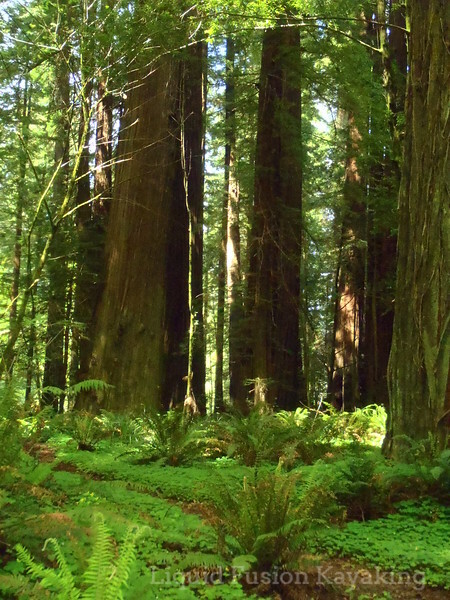 Photos barely do justice to the grandeur of the redwood forest. 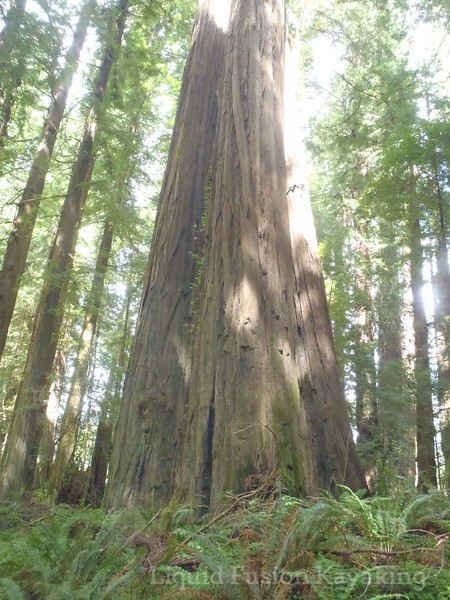 It felt good to stretch our legs, eat some lunch, and of course enjoy the awesomeness of the redwood forest. An abandoned road in Avenue of the Giants. Back in the boats, we journeyed along the 101 corridor. The river is quite wide at this point and moving fast. 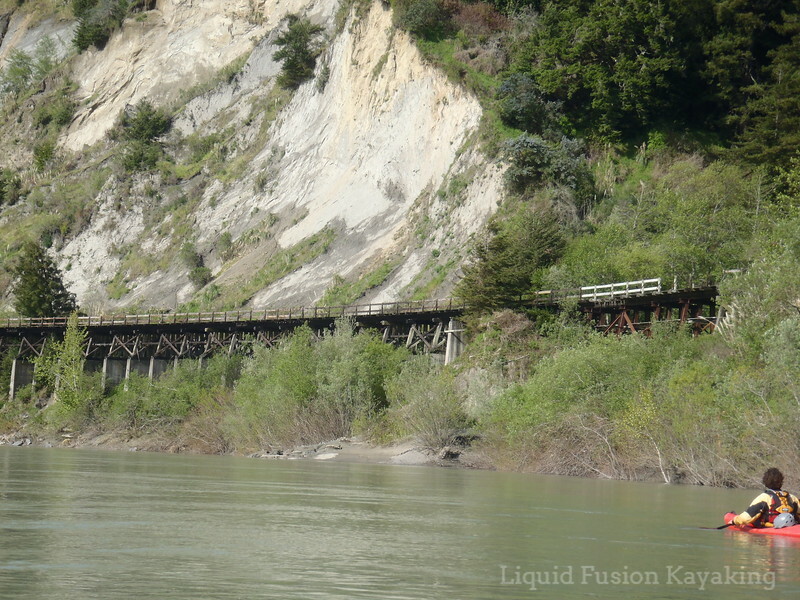 At times we still see evidence of the Eel River Railroad. We also notice that the geology has changed significantly from the jagged, dark sandstone to smoother, lighter colored sandstone. At the town of Scotia, we landed to stretch our legs. Jeff decided to jaunt into town and get some tasty beverages for our last night on the river. Up until this point, we have been totally self sufficient. 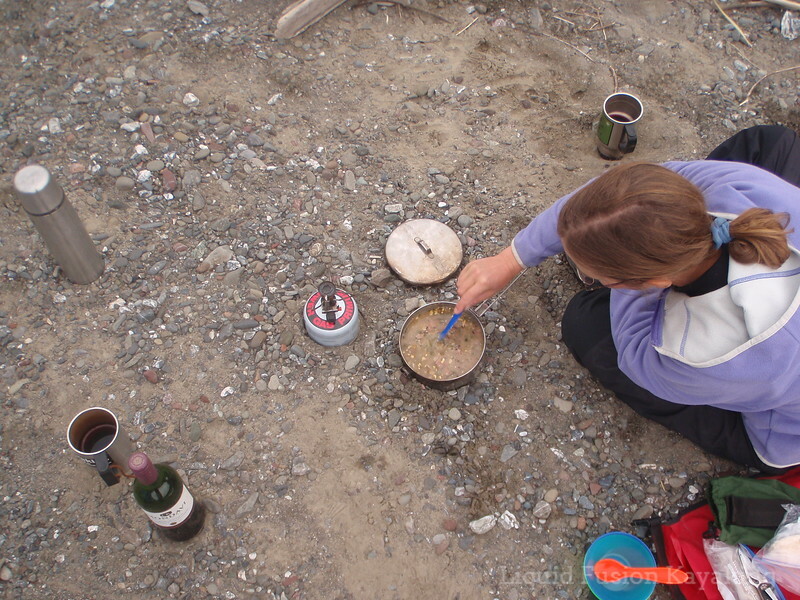 We had planned enough food for 10 days and still had plenty, but why not enjoy a comfort of being close to civilization. As he started to hike up the hill toward town, the local photographer that we met in the redwoods greeted him and gave him a ride into town to the local market. Landing at Scotia near an old dam. On down the river we traveled. Highway 101 crossed over us numerous times and seemed to be ever present. 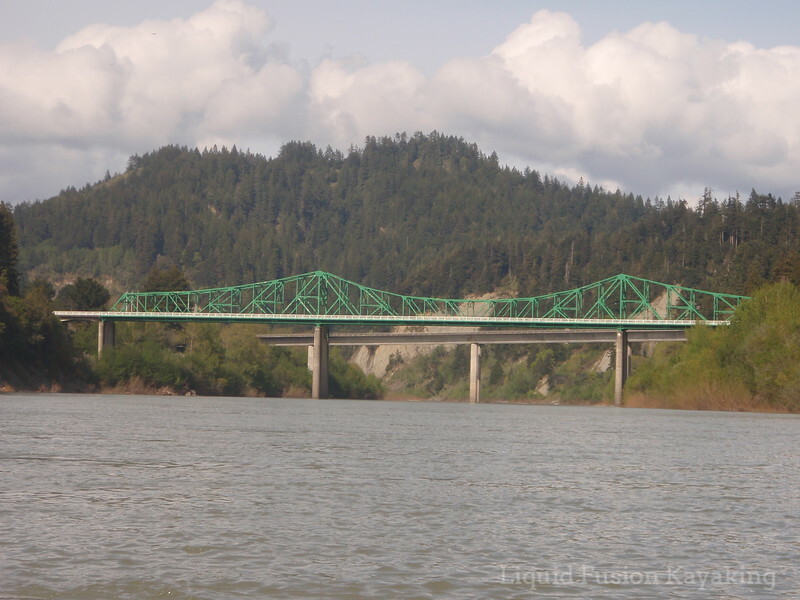 Highway 101 crossing the Eel River. 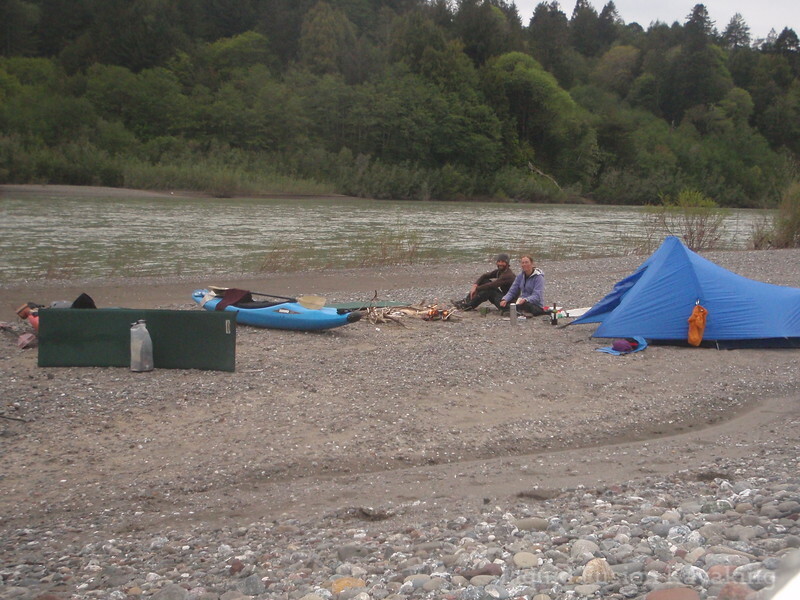 We found a campsite on a gravel bar that was on a bend away from the highway and enjoyed our last evening on the river with a nice bottle of wine and another one pot meal. One pot meals were lightweight but hearty and easy to prepare. We planned to complete our journey and reach the sea the next day. 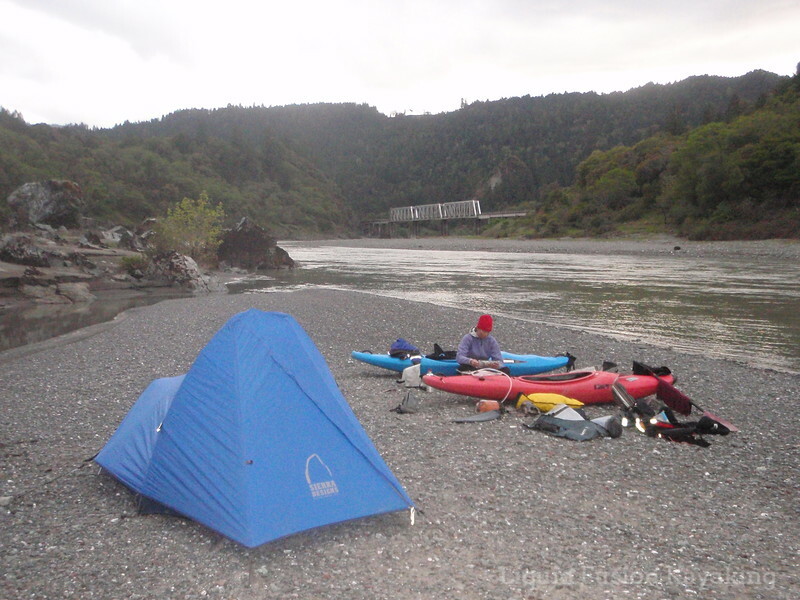 Last night camping out of our kayaks on the Eel River. Day 8 - To the SEA! 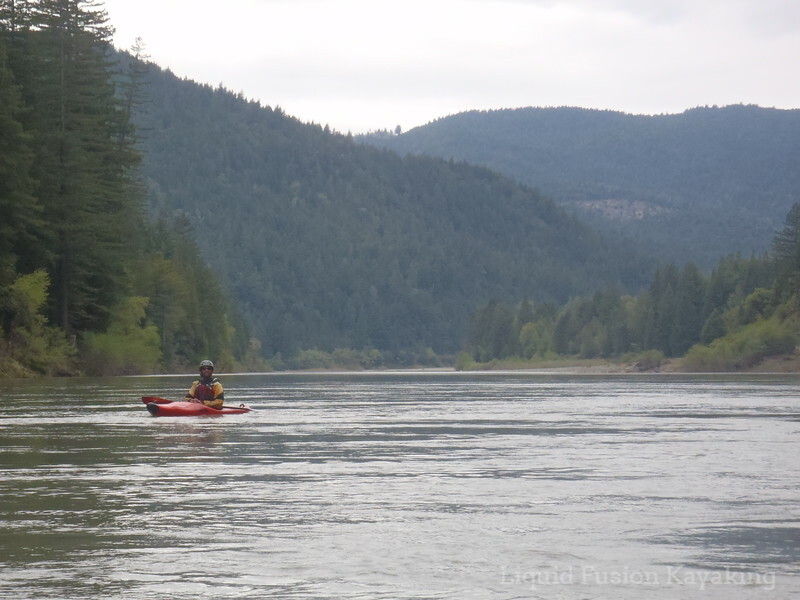 On Day 6, we launched from Cain Creek Crossing and continued down river. Our spirits were a little low as it was raining again, and we knew that the whitewater portion of our trip was over. Before too long, our spirits soared. This current was moving us along quickly and the scenery was spectacular with lots of waterfalls. We don't have a lot of good photos from this stretch of the river because of the low light and rain but our memories of it are how serenely beautiful it was. We saw lots of nice beaches for camping. The area was becoming more forested. 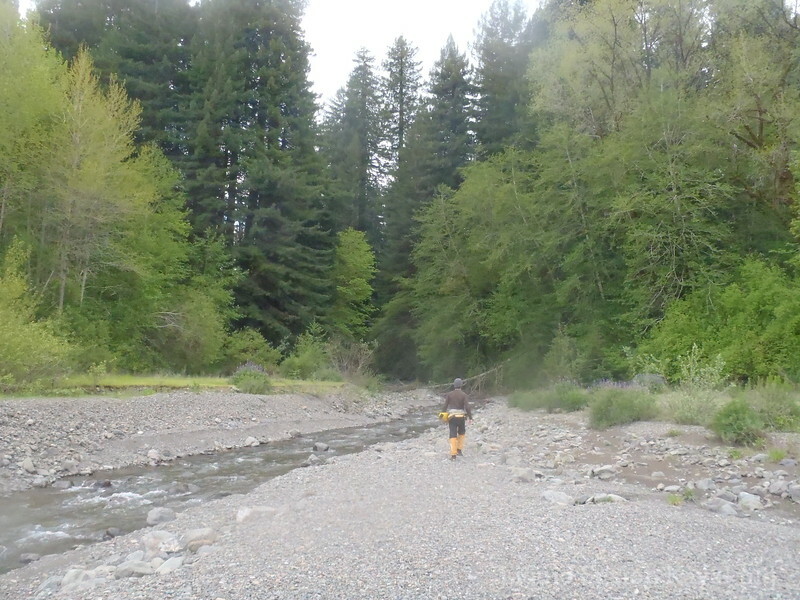 We were starting to see more coniferous trees along the river including redwoods. It was a great day for floating and contemplation. We stopped for lunch to explore a side creek that had numerous cascading waterfalls. (one advantage of the rainy weather). Just above the confluence with the South Fork of the Eel River, we were awed by redwood trees towering over us on both banks. In some spots, the redwood trees, overgrew the railroad trestles. We were on the edge of Avenue of the Giants. When we went under the Dyerville Bridge just above the confluence with the South Fork Eel, we knew the remote wilderness portion of our trip was over. It had been a long day on the water. We covered over 24 miles and were tired and chilled from all day in the rain. 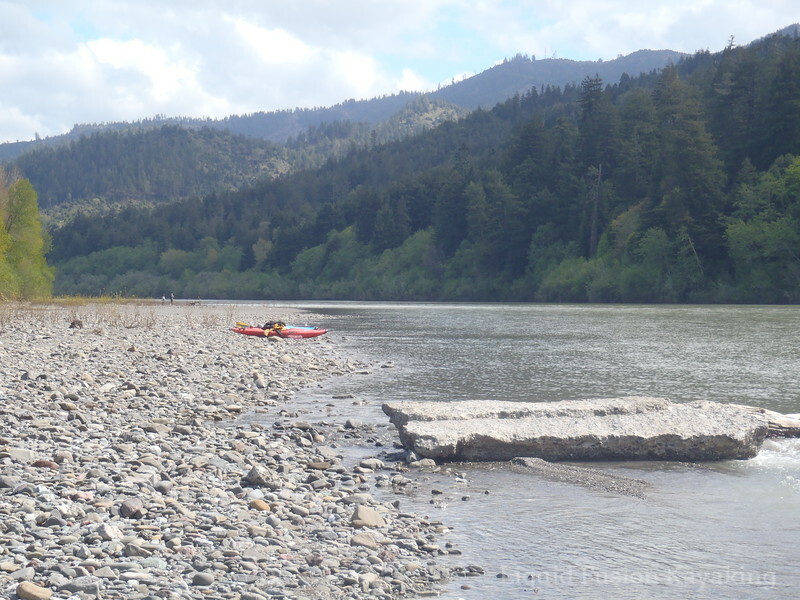 We floated down to a gravel bar where Chris Creek enters the Eel River and set up camp. We ate dinner and crawled into our tent for the night. 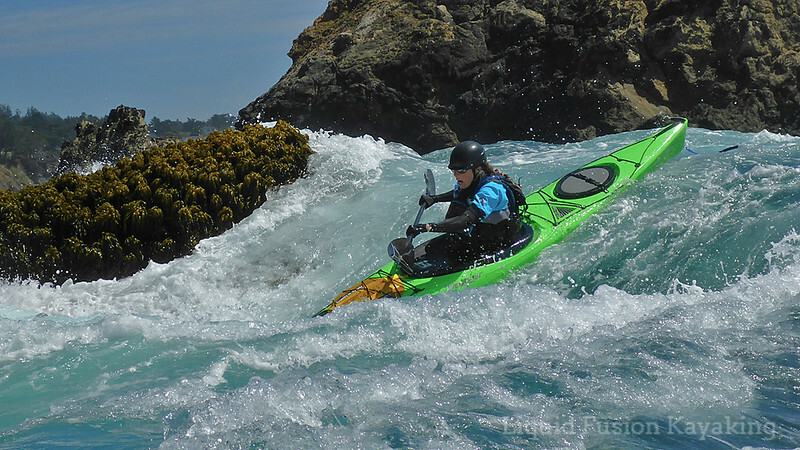 Northern California has an awesome coastline for sea kayaking - specifically rock gardening. 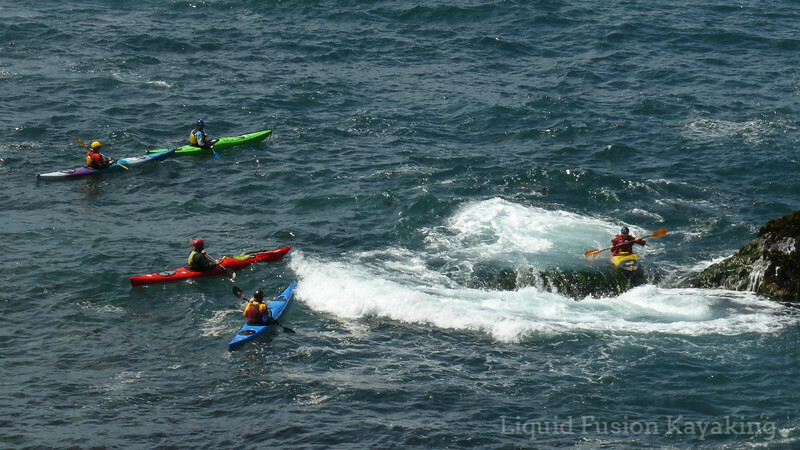 There are many variations of kayaking in ocean rock gardens. I believe the simplest explanation of rock gardening is kayaking in and around rocks in the ocean. 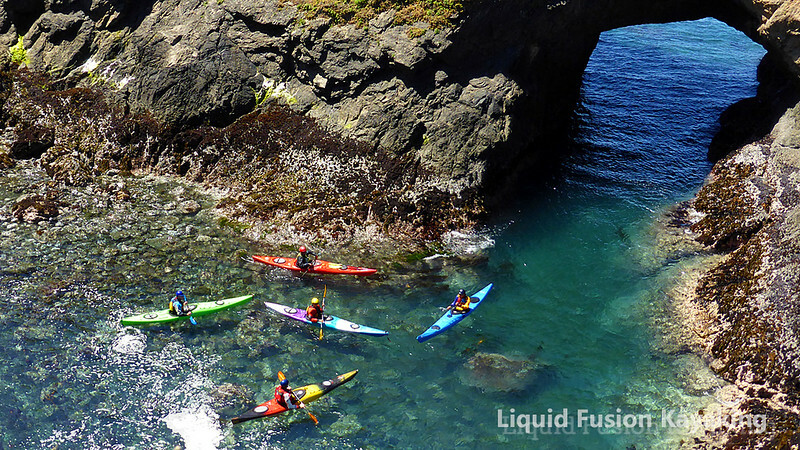 Sea kayaking in the rock gardens and sea caves of the Mendocino Coast. Variations range from tooling around rock gardens and sea caves in calm conditions to traversing technical passage ways, riding pour-overs, and surfing in rock gardens and sea caves. For safety and enjoyment, it is important that we follow the written and unwritten rules of this marine playground. Cate with a juicy rock garden pour-over ride. First we need to consider that this is not just our playground but is home to many marine creatures and our actions can effect their survival. Right now, things are drastically changing in the Eastern Pacific. Many marine creatures are struggling to survive. The rock garden habit in which we play is quite sensitive. Tread lightly - avoid landing on and crushing marine life. 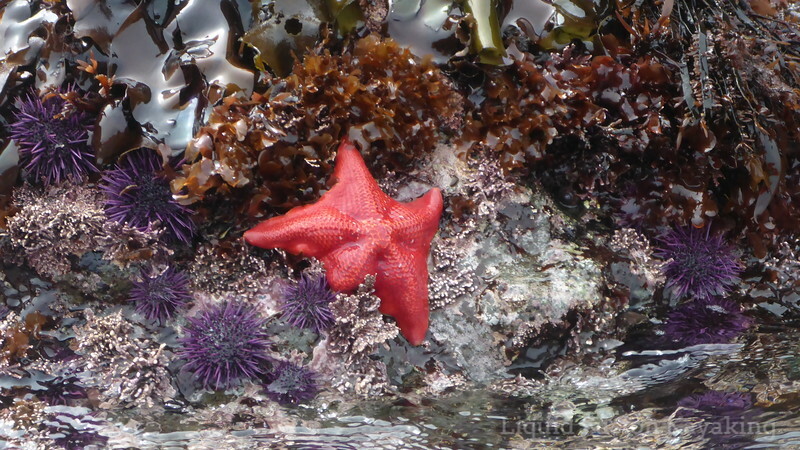 Mussels, kelp, sea stars, anemones, and abalone are all important to the balance of the marine ecosystem. Be cautious about where you land and try not to step on creatures or injure the kelp. Police plastic - pick it up and pack it out. We all find trash and plastic out in the marine environment. Help out by picking it up and packing it out and of course packing out your own trash. 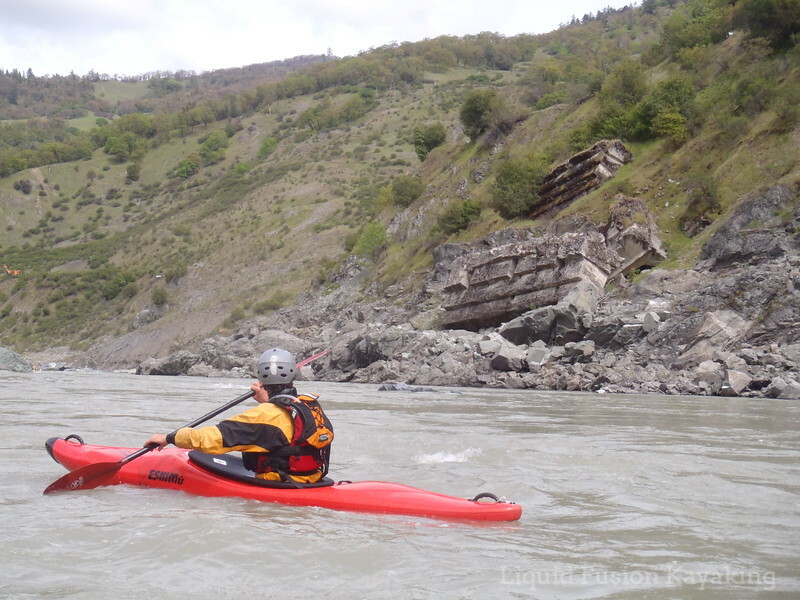 Minimize impact of plastic from kayaks on rocks. 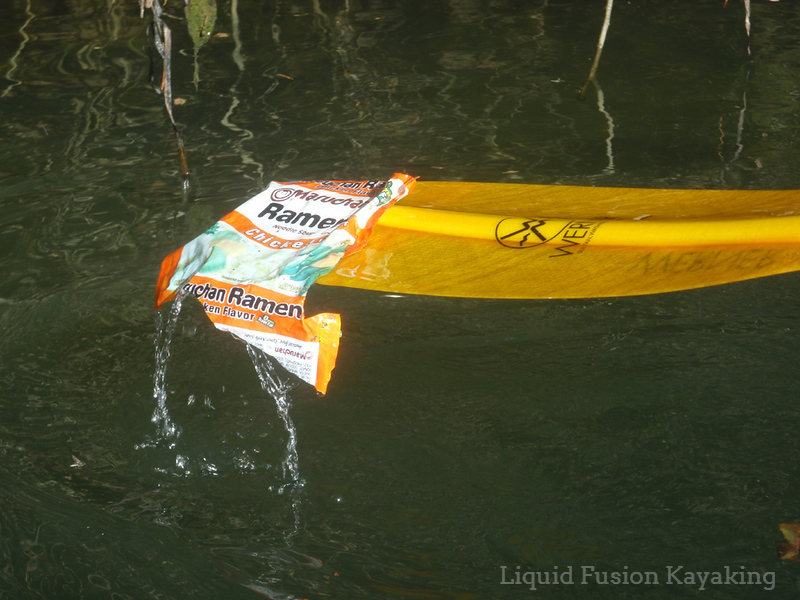 Timing, boat control, and judgement are key skills to make sure that we don't impact rocks with our kayaks and leave behind plastic curly-q's. If the tide is too low or the swell is not powerful enough to run a feature without scrapping over it, move on and find a spot that is working. Avoid landing and dragging kayaks on abrasive rock surfaces including mussels and barnacles. Be aware and avoid wildlife during the nesting and pupping season. Most paddlers are aware of the Marine Mammal Protection Act and are conscious of not disturbing harbor seals. It is also our responsibility to avoid bird nesting areas during nesting season. On the Mendocino Coast, this is typically March through the beginning of August. The population and nesting success of birds that nest near shore is being monitored by local and state Audubon Societies as well as by Fish and Wildlife. Human disturbance is a considerable issue and one that often results in chick mortality. Human disturbance can also lead to areas being closed. It is best for us to avoid these areas during the nesting season. On the Mendocino Coast, species of concern is the pelagic cormorant. 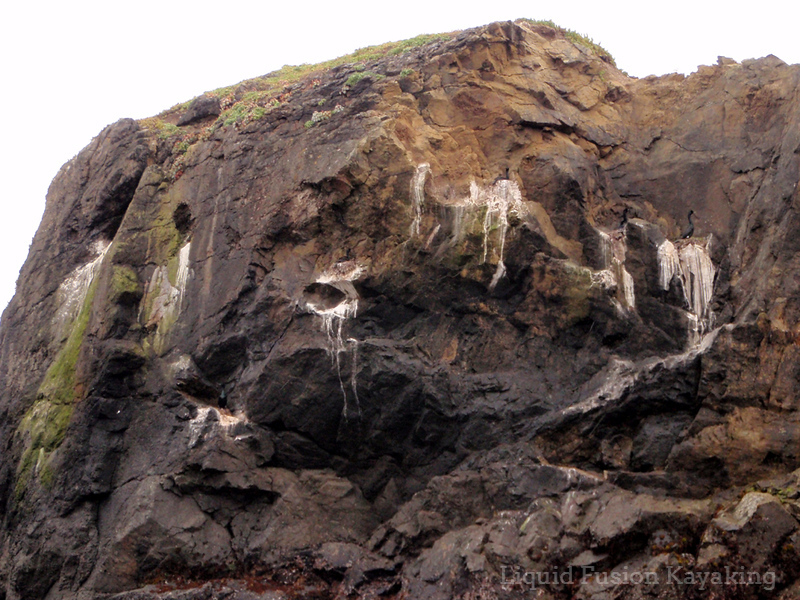 Pelagic cormorants nest on the cliffs of headlands, near shore rocks and commonly around sea caves. 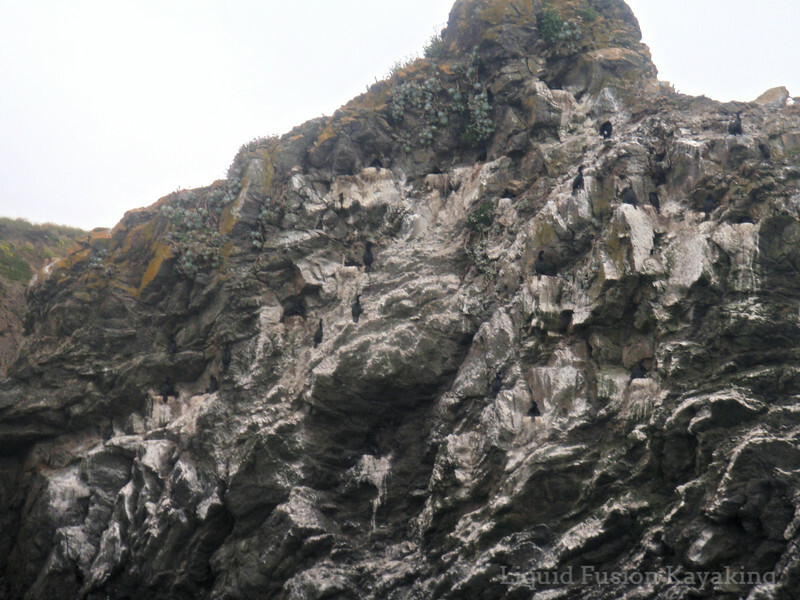 Large nesting colony of pelagic cormorants on the Mendocino Coast. Smaller nesting colony of pelagic cormorants. Stay tuned for Part II where we talk about rock garden etiquette related to humans. Sea kayakers using a circuit for safety and fun. 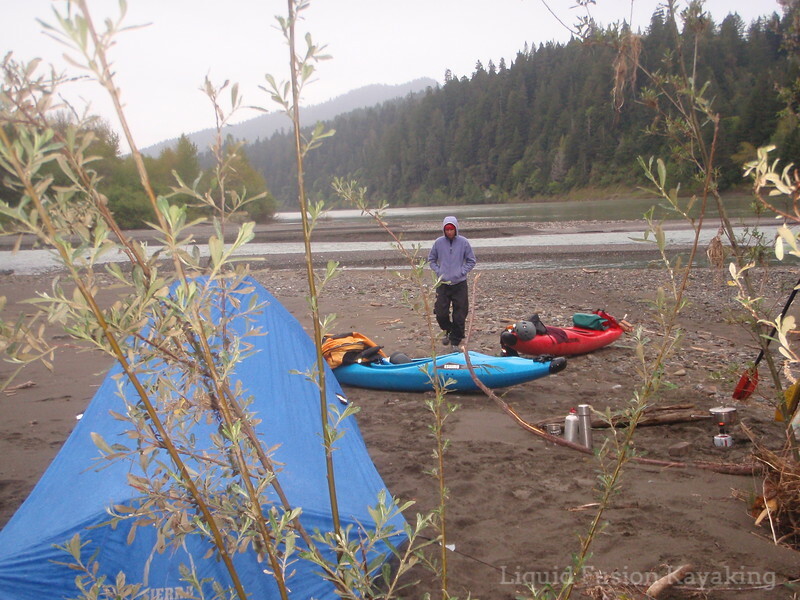 Day 5 - We awoke at our camp at the confluence of the main and north fork Eel to sunshine!!! 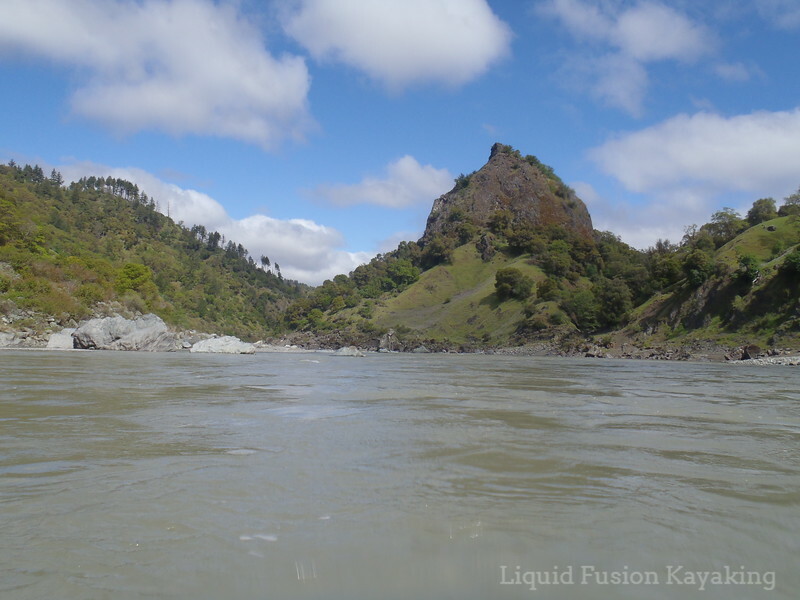 After enjoying the previous day of exhilarating whitewater and a relaxing afternoon and evening on the beach, we feel ready for whatever lies downstream. 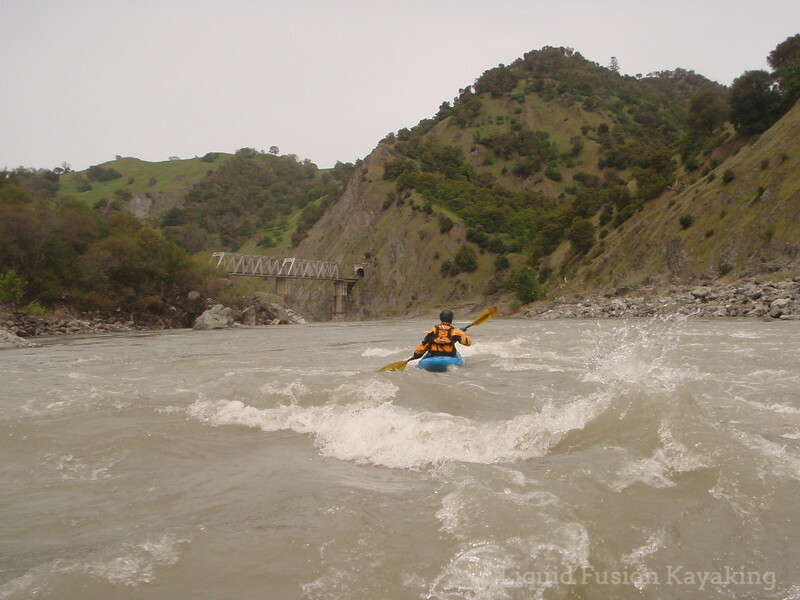 We know that the toughest rapids of the Dos Rios to Alderpoint stretch are coming up. They are class III, but we are expecting powerful hydraulics caused by the high water. We start the day immediately with some fun rapids. The river is still flowing very fast. We estimate it to be in the 12,000 cfs range. 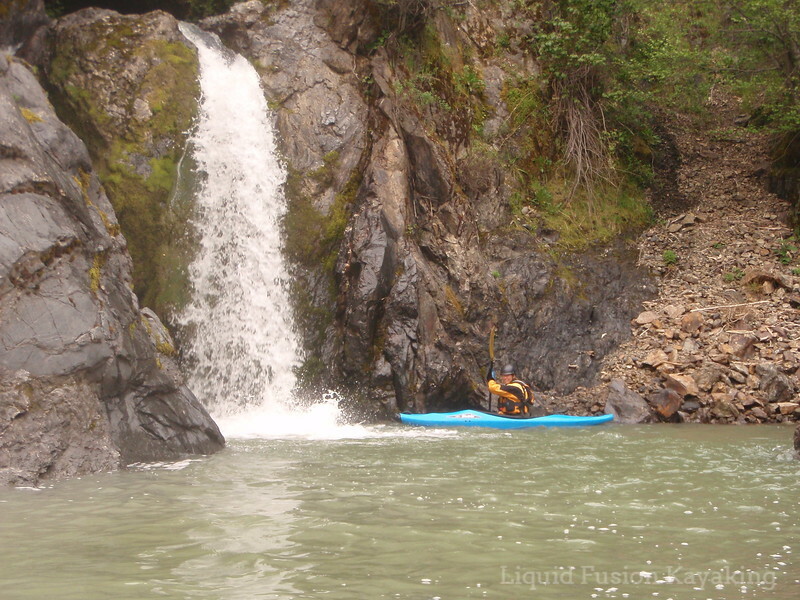 The water is quite squirrelly at this flow with boiling eddylines that grab at our kayaks and try to spin us about. The country is fairly open. 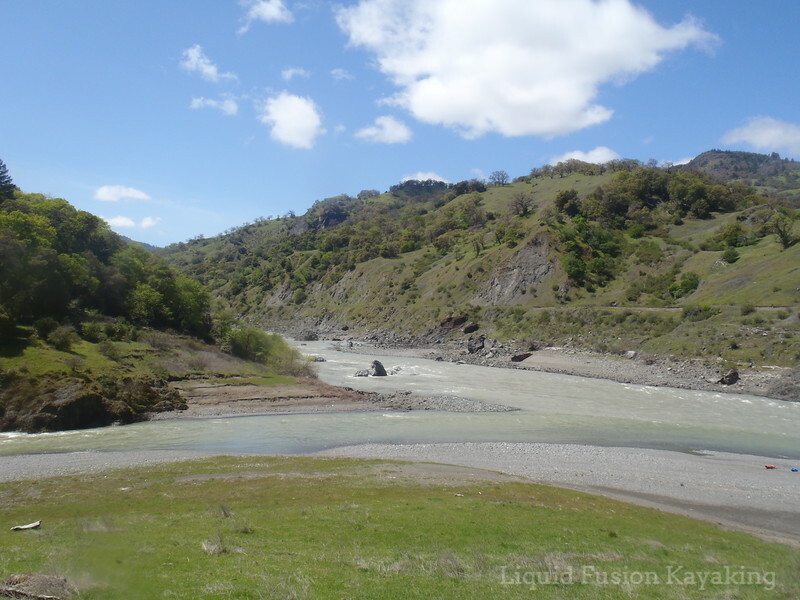 The gradient of the river is not very steep but the current is fast for several miles. Then around one bend, things drastically change. The river constricts between some boulders, and we seem to be entering a steeper gorge section. We suspect that we are at Island Mountain Falls and get out to take a look. This was one of the most fascinating scouts that I have ever done. I guess because I am continually amazed at all of the abandoned infrastructure, machinery, and rail cars of the Eel River Railroad. 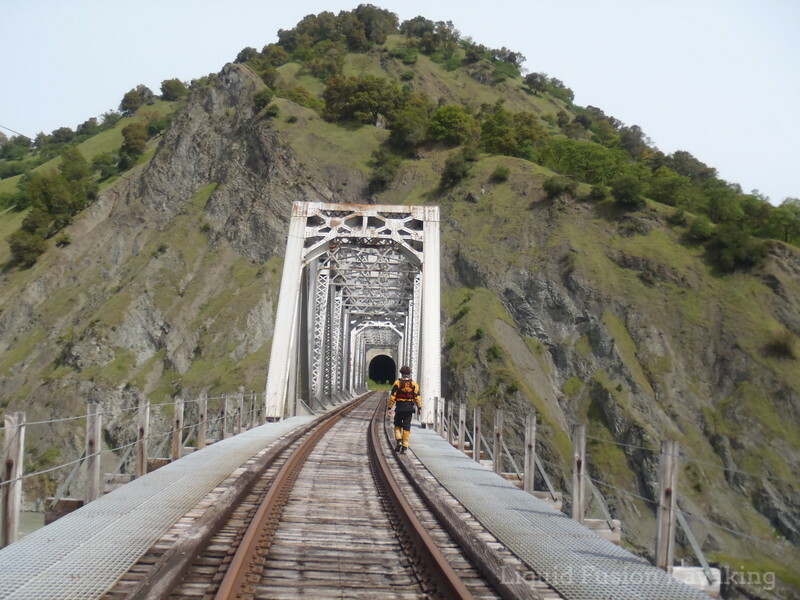 The railroad through the Eel River Canyon was opened in 1914 to transport logging and mining materials and passengers between the San Francisco Bay Area and Eureka. 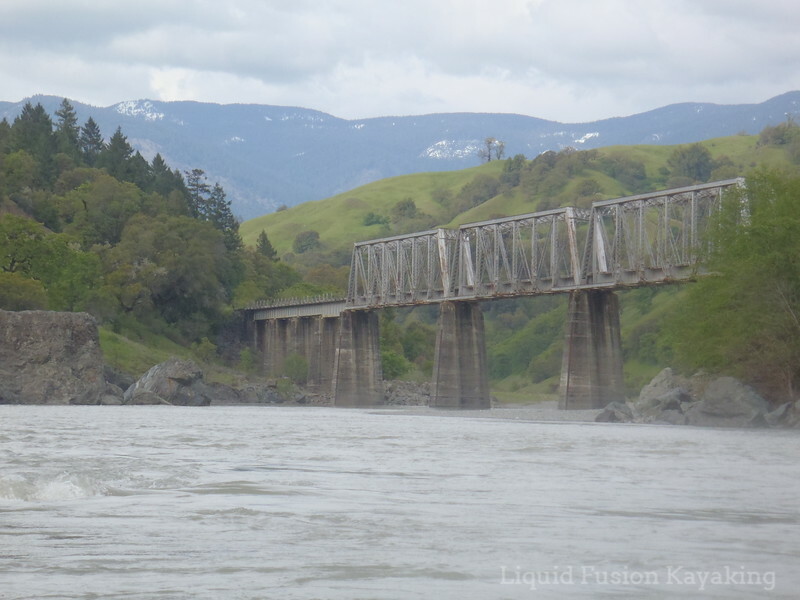 Since opening, the unstable soils and floods of the Eel River have wreaked havoc on the railroad infrastructure. A continuous battle ensued between man and nature to keep the 95 miles of tracks and 30 tunnels clear. 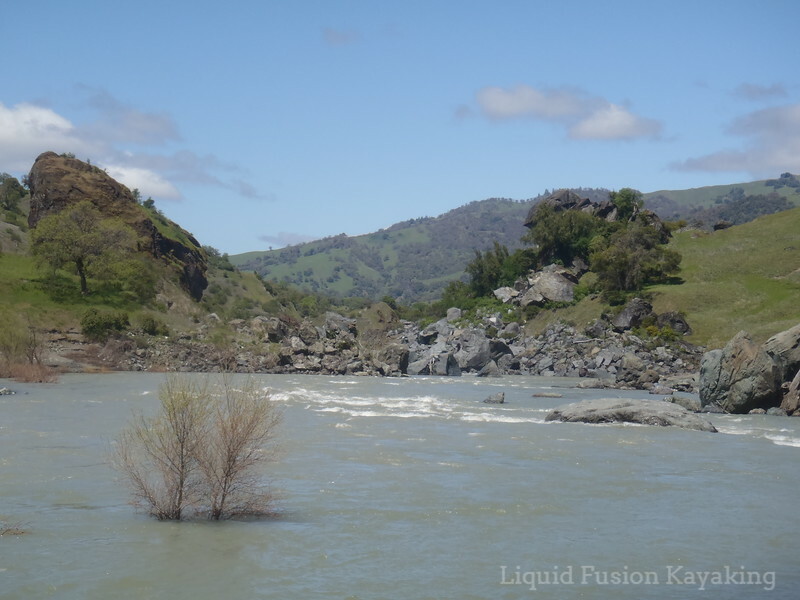 The Eel River Valley has the highest erosion rate in North America. The employees of the railroad were constantly working to clear the track, rebuild the tracks, remove debris from the tunnels and repair cave-ins. 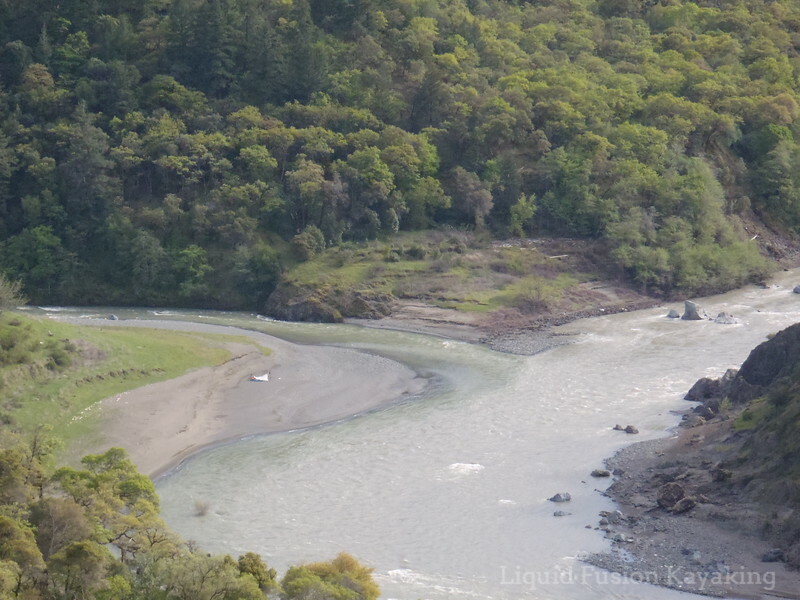 Traveling down the Eel River, catastrophic devastation is evident everywhere. 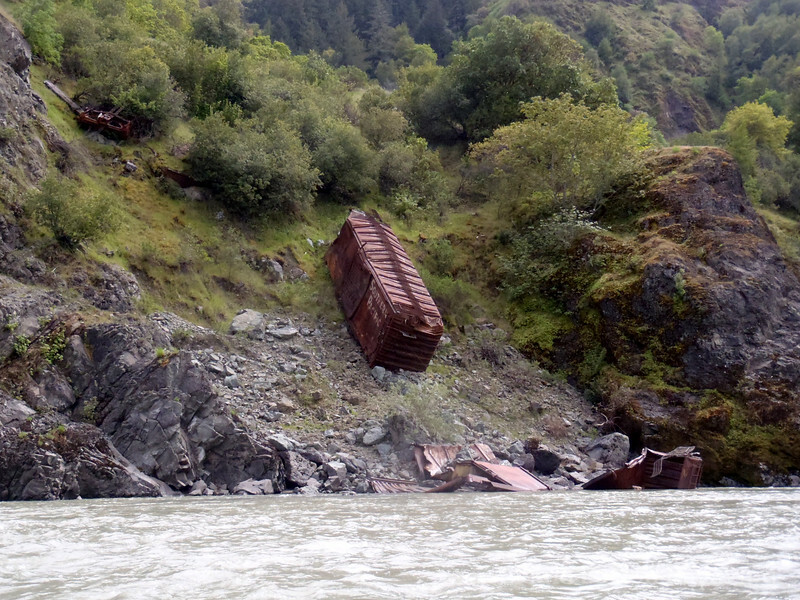 Derailed cars lie on their sides on the steep banks of the river and in the bed of the river. The ground has eroded out from under the tracks leaving the tracks suspended in the air and washed into the river. 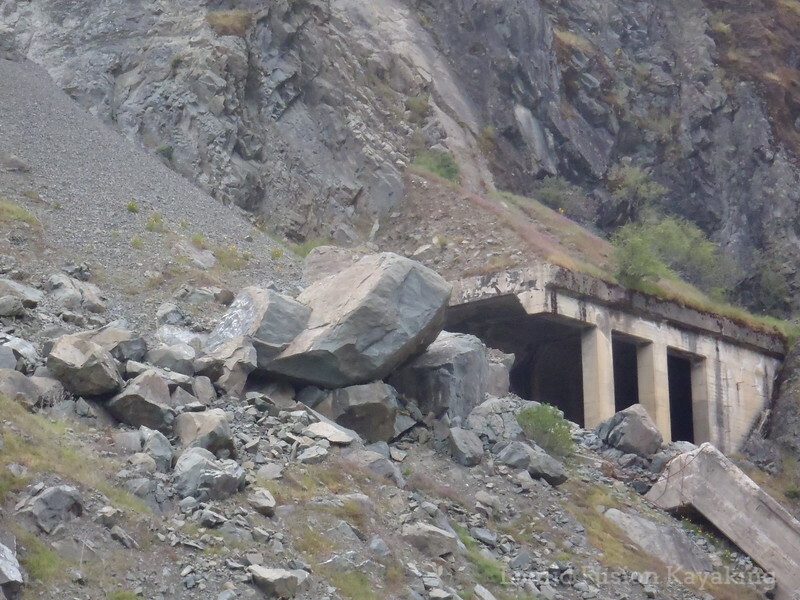 From the river, most of the tunnels appear to be caved in or blocked by landslides. Part of the wonder is the way that nature is working to reclaim the terrain. In 1997 the railroad was abandoned. Some of the Eel River Railroad employees now work for the Skunk Train in Fort Bragg and Willits. It is fun listening to tales of their adventures on the Eel River Railroad. We hiked along the railroad tracks to the bridge that crosses over the river and the entrance to the mile long tunnel that goes under Island Mountain. It is called Island Mountain because the river circles around the mountain almost 300 degrees. Standing on the bridge we are well over 100 feet above the river. It is amazing to think that in December 1964 the river flooded over this bridge and into the tunnel. 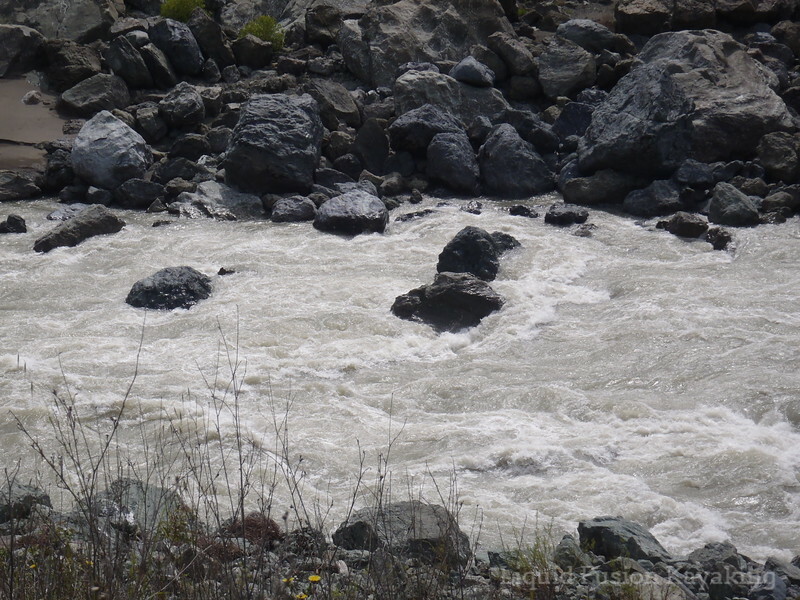 During this Pineapple Express Storm, the river was flowing at 936,000 cfs. At Island Mountain, we hiked along the railroad tracks. From above we could see the line that we needed to paddle through Island Mountain Falls. 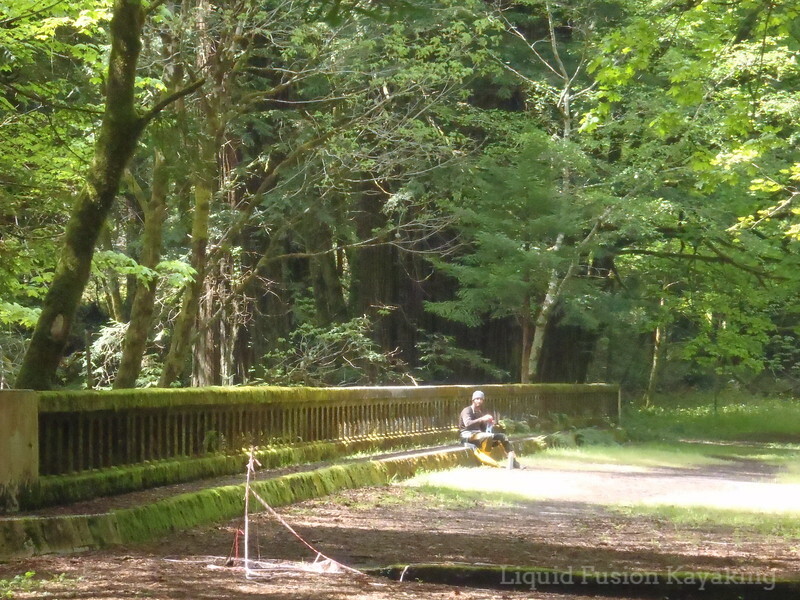 The water was definitely moving fast but the line looked fairly straight forward. 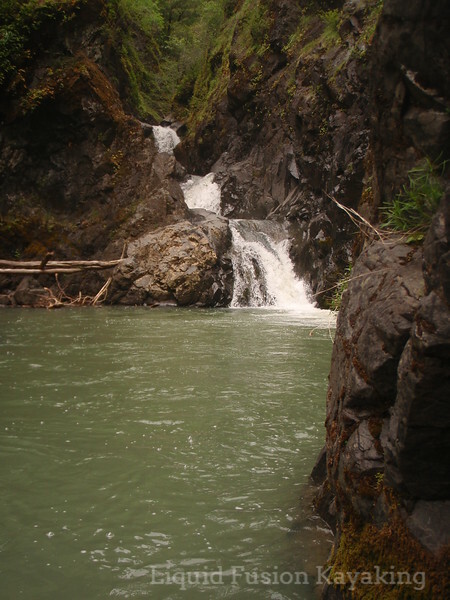 Our run through Island Mountain Falls was fun and exhilarating. The line was straight forward but the hydraulics that we were paddling beside were HUGE. On down the river we traveled. 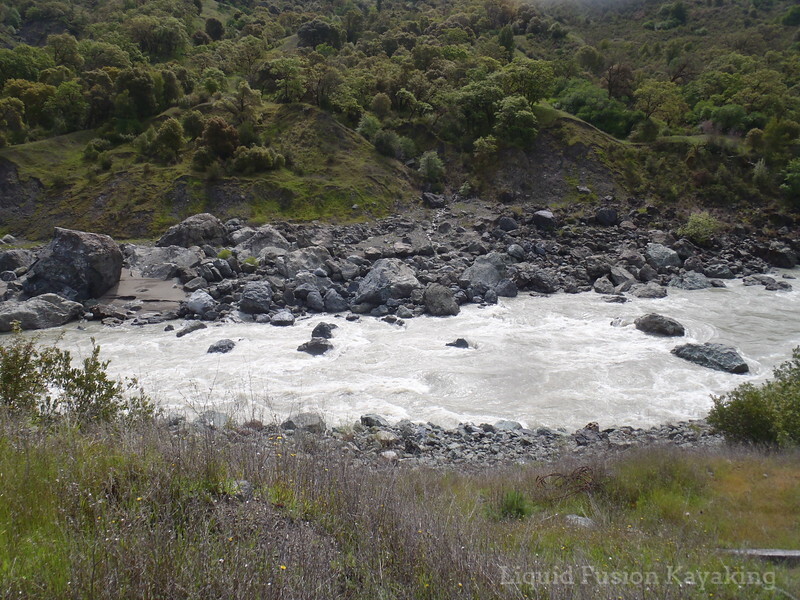 The current was fast and we were enjoying the sights when suddenly the topography on the banks of the river got steep and lined with boulders. The river was constricting, and we saw a horizon line - Kekawaka Falls. Kekawaka Falls is a river wide hole (hydraulic). The reversal was so powerful that I cleared it but it sucked me back in. 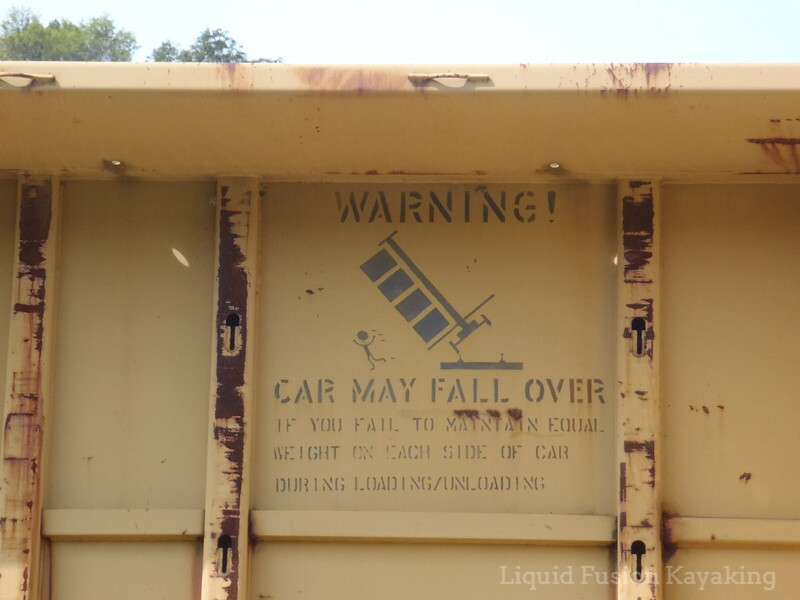 I dropped my edge and capsized but it flushed me out and I rolled up. After Kekawaka Falls, the river valley started to open up and so did the skies. We continued down river past Alderpoint which is the regular take out for multi day trips on the Eel. We started scouting for a campsite but with the high water, they were hard to find. 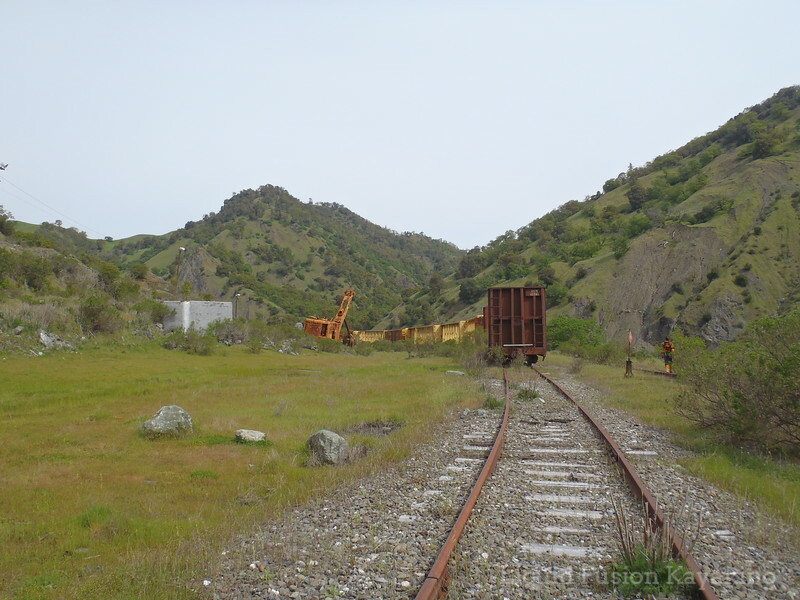 We finally settled on a spot near Cain Creek Crossing where the golden spike was driven in to the rail line in 1914 to celebrate the opening of the Eel River Railroad. The railroad was closed that same day due to a landslide. At our camp, we prepared for the upcoming days of flat water - including paddling through the giant redwoods trees of Avenue of the Giants. On day four we awoke at Camp Cranky Pants to clear skies. A good night's sleep and we were ready to paddle to the North Fork of the Eel - about 17 miles. We started the day enjoying the scenery. 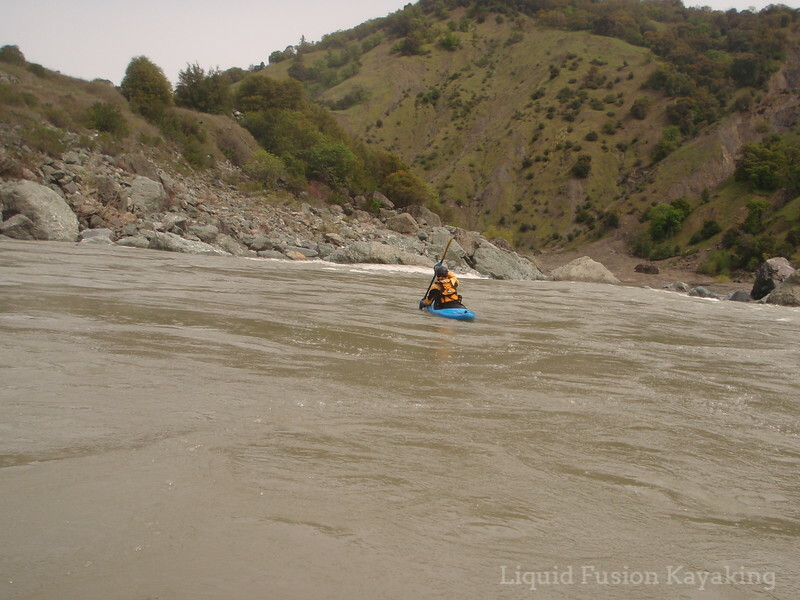 Since Dos Rios, the river has been moving fast but didn't have a lot of whitewater. 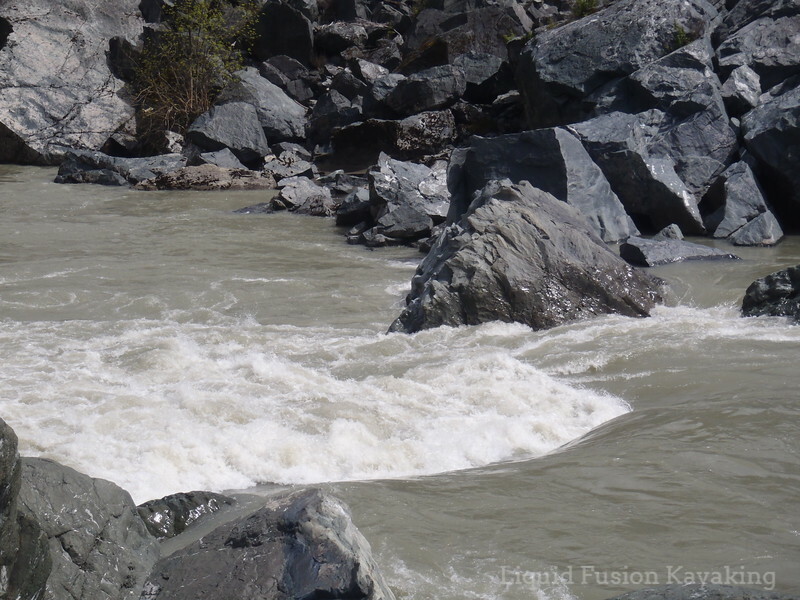 We knew that we would encounter some whitewater on the Dos Rios to Alderpoint Stretch but weren't sure when. 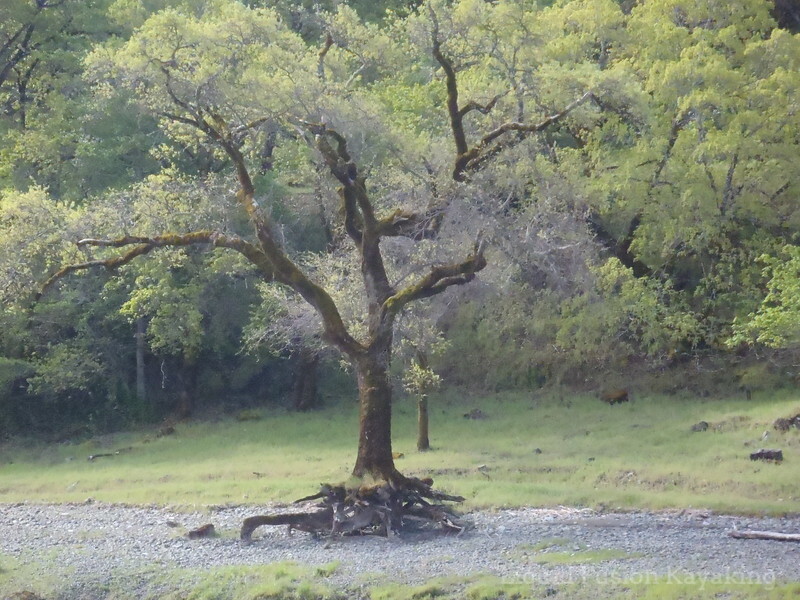 One of our favorite sights was an Ent - a walking oak tree - at least in our imagination. The Walking Oak - An Ent? A little further down, we recognized spy rock from photos. After this it was grab on hold for some spectacular big water whitewater. We didn't get any photos of the whitewater because it was so fast and big and just the two of us reading and running down the river. I LOVED it!!! The waves were so big that you had to sight your line from the crest. Jeff mentioned that this was the type of whitewater on the Grand Canyon. It was so fun that we debated dragging out kayaks up to the railroad bed and portaging them up river to run a bit of it again. 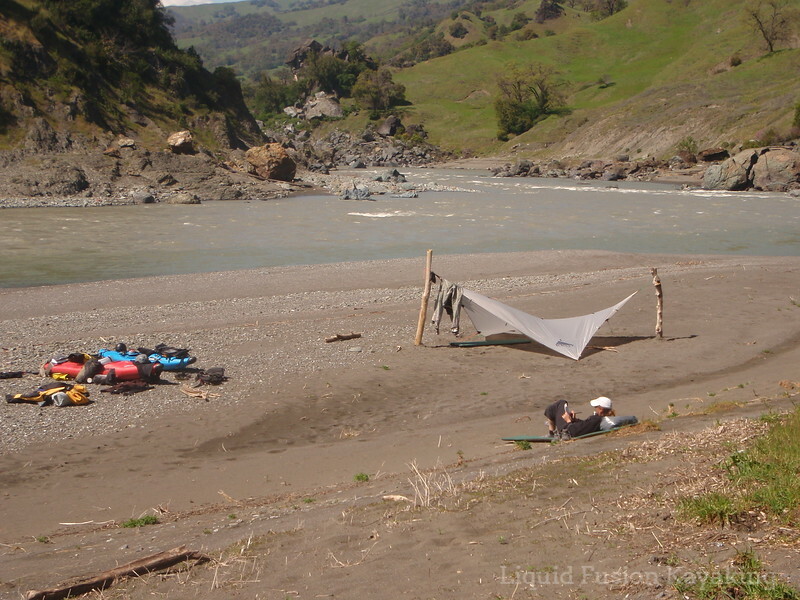 In about 2 hours we reached the confluence with the North Fork of the Eel and our camping destination for the day. It was only lunch time. We had traveled 17ish miles in 2 hours. Confluence of the North Fork Eel with the Eel. We had lunch along the North Fork and debated whether to keep going or to set up camp for the night. 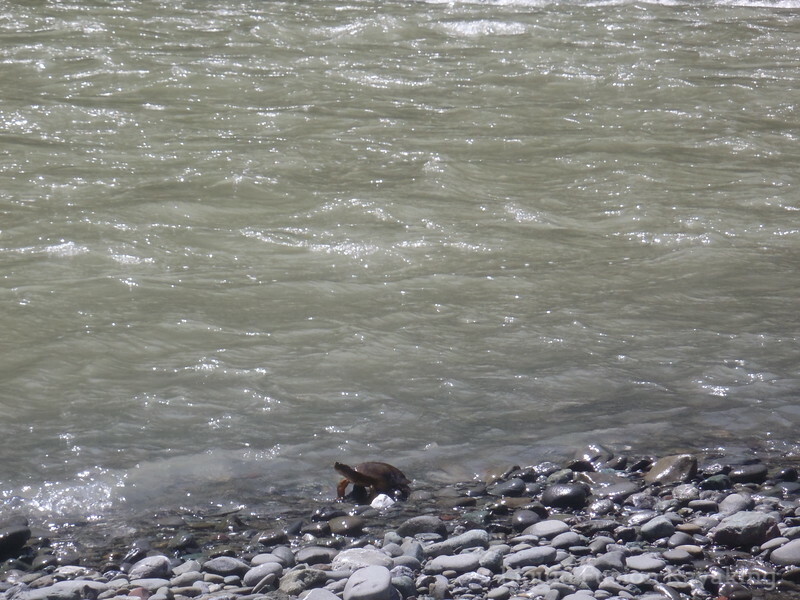 It was sunny and warm and we enjoyed watching a turtle walk up the side of the river, flop in and swim about 20 feet down stream and then walk back up and do it again and again and again. We decided to enjoy a day of sunshine in camp. 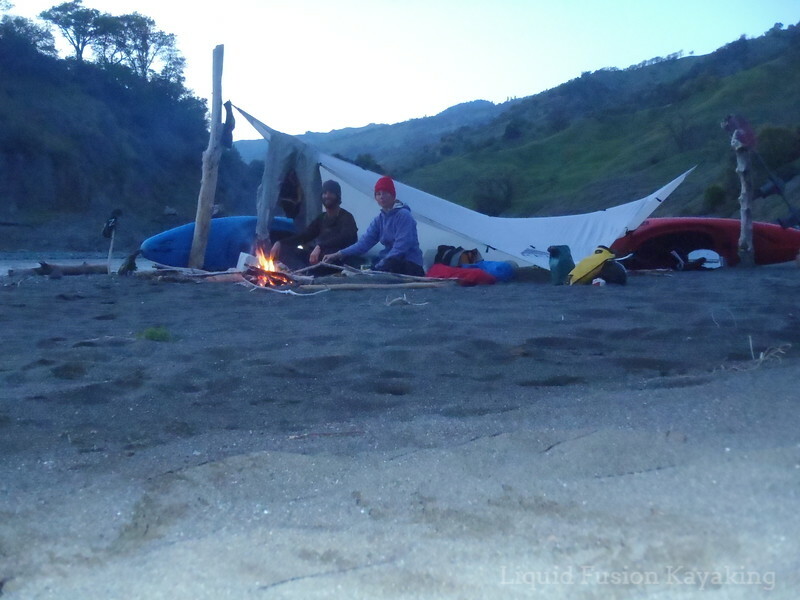 This has become our multi day paddling habit - make miles on rainy days and enjoy time in camp on sunny days. The camp at the confluence of the North Fork Eel is a beautiful place. We enjoyed some time taking in the scenery, catching up on trip notes, and took a short hike. Our tarp and tent way, way, way, down there on the beach. Beautiful scenery, interesting wildlife, fun whitewater, sunshine, and good company made for a great day! 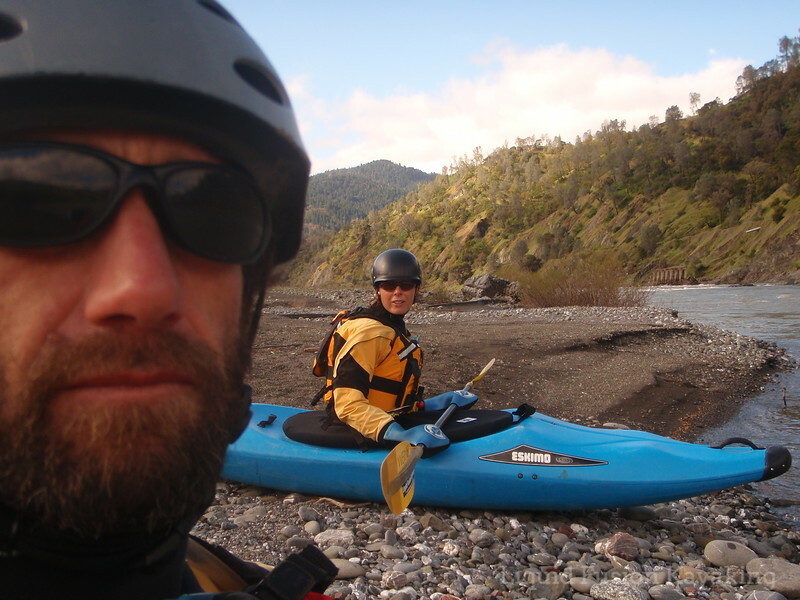 Cate and Jeff camping on the Eel River. - April 2011.